My travels this week have taken me to Tunica, MS to learn about using Social Media to promote our destination. While it's one of the most incredible conferences I've attended - great speakers, great workshops and great new colleagues that are new friends, one of the greatest things about attending a conference like this is getting to explore the area. You all know of my love for music, and there is no better place for music than the Mississippi Delta. 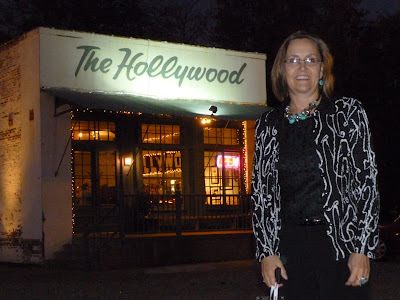 We had the good fortune to have dinner Wednesday night at the Hollywood, made famous in the Mark Cohn song "Walking in Memphis." For those of you who know me "IRL" (I told you I'm learning a lot at this social media conference - that stands for "in real life"), my name is Muriel, and while I don't play the piano, being named Muriel means I don't get my name in a lot of songs, so I was happy to have the chance to visit this historic location. Walking in Memphis has been covered by Lonestar and Cher (although she changes the lyrics to "Gabriel"). I really recommend a trip down here for the great people, music and history, although I don't necessarily recommend our accommodations - the Harrah's casino. Nice enough, but kind of in the middle of no where, so without a car it's a challenge to explore.